I expected it to be an interesting experience when I accepted the invitation from Ferndale Combined School at Phoenix to conduct a ‘Motivation class’ on Self-confidence. It turned out much more than that. 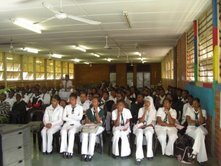 It was held in the School’s auditorium on Monday, 21 July, 2008 between 1 and 2 pm for the Grade XI learners. 111 students assembled there to whom I talked in an inter-active style. 20 of them were of Indian origin and the rest 91 were African Black children. A number of Educators were also present. There were students from other communities like Muslims and Christians, besides Hindus. Quoting Nelson Mandela’s strong determination to free this great country from the shackles of apartheid, I explained how much ‘self confidence’ in one man could turn the course of the history of a country. I narrated what kind of hardships he had to face at Robben Island prison for long 27 years and how he tackled every adverse circumstance into a positive one. His 90th birthday was recently celebrated by all his admirers throughout the world. Then I dwelt on the great Saint of India, Swami Vivekananda who instilled the confidence in self, humanity and God as indispensible for the progress of the individual and the society. Inspiring incidents from his life were explained. I also spoke of the Jesus’ saying and an incident from Mohammed’s life. I could not but admire deeply the high discipline that the pupils exhibited during the course of the class. Thereafter Pastor Dixon, a member of the Governing Body of the School and also the Head of Ecclesia Family Church in Phoenix spoke. The Dy Principal Mrs Naidoo gave a vote of thanks while the students honoured the guests with flowers. At the end of the class, students recited Vedic, Bilblical, Koranic and Zulu prayers. One of the Educators later distributed “Deepika” the Children’s spiritual magazine to the interested students. This is an annual magazine brought out by Sri Sarada Devi Ashram, Asherville. I believe that Ferndale demonstrates that we,the youth of South Africa are tolerant enough to acknowledge and accept the religions of others. This is so important as we live in such a culturally diverse country. I am sure that the youth at Ferndale thouroughly enjoyed Revered Maharaj’s lecture on Self-confidence, as much as we all do. We feel very much proud of ourself that Our own Swamiji is sharing the dais with representatives of other religions, and almost visualise Swami Vivekananda GIVING THE TEACHINGS OF VEDANTA TO THE WHOLE WORLD AT PARLIAMENT OF RELIGIONS. I personally would love to read the whole speech given by you. We are very much GRATEFUL to you for taking out time from your BUSY SCHEDULE TO SHARE these news and posts on your Blog. In today’s day and age with the influence of pier pressure, many young children go astray. With both parents working these days majority of our children are becoming “latch-key kids” or children who come home from school to an empty house. With more inter-active participation from religious based organizations, i am sure that some positivity will come off it. i am sure that with Swamiji’s uplifting and spiritually powered talk the children were highly motivated. I am sure that the lecture on self confidence was throughly enjoyed and the present day youth learn from this and will be motivated. I too would like to read the lecture my self. We are great full that you have taken out time to share this with us all. It was so wonderful to read about Maharaj’s motivational speech at Ferndale.Living in a diverse country like ours ,it is very important to learn and understand our fellow citizens cultures and traditions.Religious based organizations like ours, play an integral part in the development of our youth and the upliftment of our community.Looking foward to meeting Maharaj in Estcourt and Ladysmith for the Vedanta Retreat. Hopefully Maharaj will have some time to give our youth a motivational talk as well. Maharaj,this is important as we live in a culturally diverse country.Youth of today will acknowledge and accept other religions, thanks to you Maharaj,I am sure some positivity will come off it. Looking foword to meeting Maharaj in Estcourt. Please accept pranams from all of us. 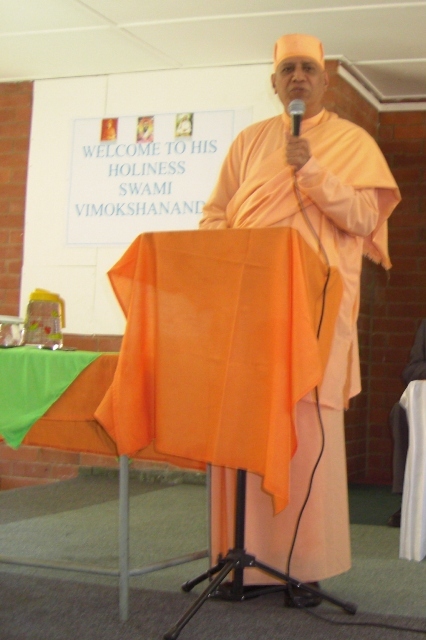 Swami Vimokshananda has given so many South Africans a majical wake up call to place one back to the GODHEAD ward journey. Maharaj’s talk must have really inspired the teachers and pupils self confidence at the Ferndale School. Maybe now it will be easier for the children to find solutions to overcome problems that they encounter in their daily lives. The pupils must have also been touched by Maharaj’s Motherly love. Thank You Maharaj for constantly guiding, teaching and showing compassion to all that You come into contact with! Lots of Love. Its inspiring to read this one. I would request you to please share the message delivered to the students too. Thank you Swamiji.